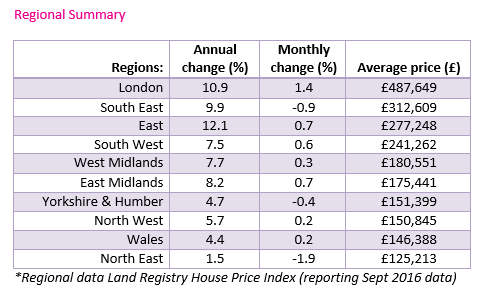 House prices are up on average 0.5% in the past month, while the rate of annual house price growth has fallen steadily since May (on average from 7.2% to 5.1% in October). 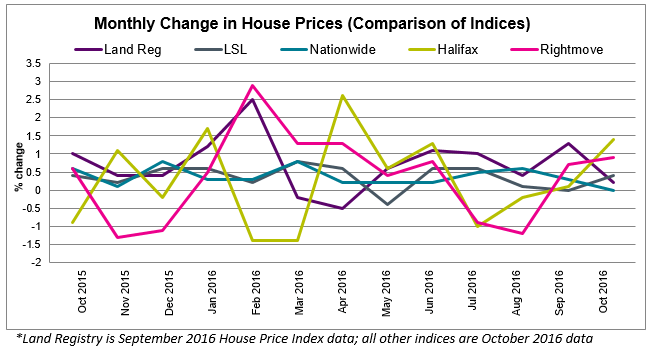 The major House Price Indices generally report house prices to be stable or up in the past month ranging from a low of 0.0% change in house prices from Nationwide to a high of 1.4% from Halifax (the average change across Land Registry, Nationwide, Halifax and LSL is 0.5%). 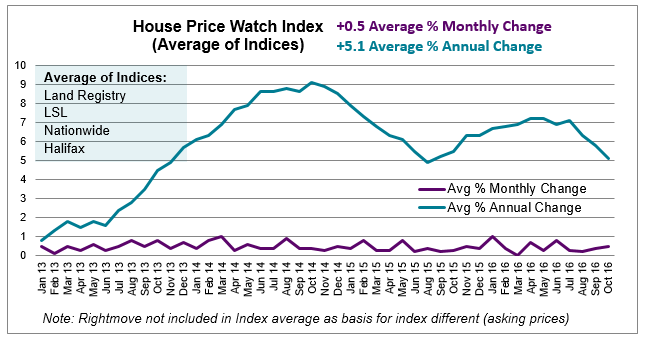 Rightmove, report an increase of 0.9% in asking prices in October. UK home sales continue to fall — down 4.3% in September and 11.3% lower than the same month last year (HMRC seasonally adjusted figures). Transactions have been tracking below 2015 levels since the surge in sales in March (ahead of stamp duty changes on second homes). However, mortgage approvals for house purchases, a leading indicator of completed house sales, increased 3% in September, the first rise in four months and a sign the market may be picking up. (Bank of England). 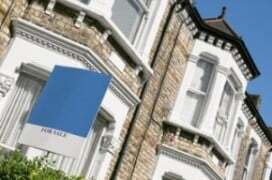 Mortgage rates are at record lows since the Bank of England cut the base rate to 0.25% in August. In addition, house hunters are returning to the market. According to RICS, new buyer enquiries are up in October. However, buyers may struggle to find properties as the number of new instructions and properties available for sale is down again this month. With ongoing concern around the shortage of homes available for sale, there is keen interest among those in the housing industry in the Chancellor’s upcoming Autumn statement and what measures he will put in place to increase housing supply and address affordability issues.